I'm currently drinking a Minhas Creek Tundra Ice Beer, which is a beer brewed for the Minhas Creek Breweing Company by the Joseph Huber Brewing Company in Wisconsin. It has 6.2% alcohol/volume, the taste is similar to most North American lager beers, but pretty watered down. The beer is only $6.90 (approx) Canadian including taxes in Manitoba, Canada, I'm not too sure if it's currently available in other parts of Canada and the United States, but it may be available in Alberta (under the Mountain Creek label). I chose this beer because it's an affordable alternative to popular brands such as the merdish Molson Canadian and Kokanee. 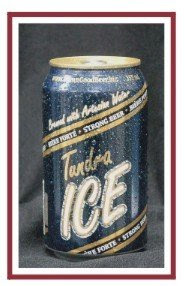 If you're in the mood for a very cheap beer, get Tundra Ice, it's in can form!